Pioneering Italian electronic composer Maurizio Bianchi teams up with fellow countrymen Matteo Uggeri (Hue) and Luca Bergero (Fhieval) to produce an album of subliminally disturbing electro-acoustic soundscapes. Subdued and arid, the clusters of sound that make up the single 43-minute track on Erimos are derived from a variety of sources, including taped sounds, prepared and processed acoustic instruments, as well as organ and electronic instruments. 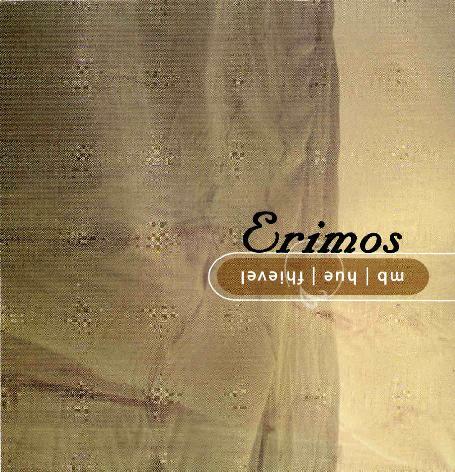 Consequently, the music on Erimos can hardly be called conventional ambient music. There’s a more purely academic approach here that recalls the exploratory spirit of such early electronic composers as Stockhausen, Xennakis and Cage. Though not “music” in any harmonic or melodic sense, the dense collages of sound (often evoking machines, generators and the like) have the effect of producing eerie sympathetic vibrations somewhere in the deepest recesses of the human brain. The result is that the listener may find him or herself slipping into fugue states that resemble epileptic trances. Definitely for late night listening, especially while a violent thunderstorm is rumbling its way toward your vicinity.